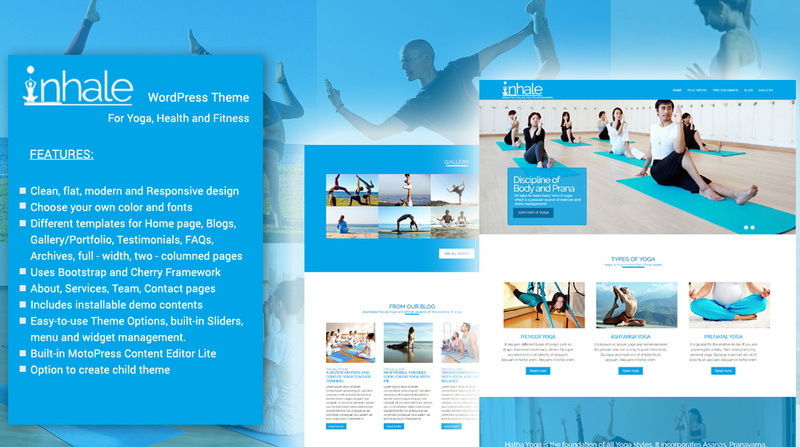 Inhale is a clean, flat and Responsive WordPress theme for Yoga, Health and Fitness. Can be used for any sort of Yoga Clubs, GYM, Health Clubs; by Personal Trainer, Fitness Instructor, even Dance Studios and a lot more. The themes uses HTML5, CSS3, Bootstrap framework, google fonts, colors, jQuery, Cherry WordPress framework, built-in sliders and MotoPress Content Editor Lite for building responsive pages without coding and simply by dragging and dropping content elements. 7. Easy-to-use Theme Options, built-in Sliders, menu and widget management.